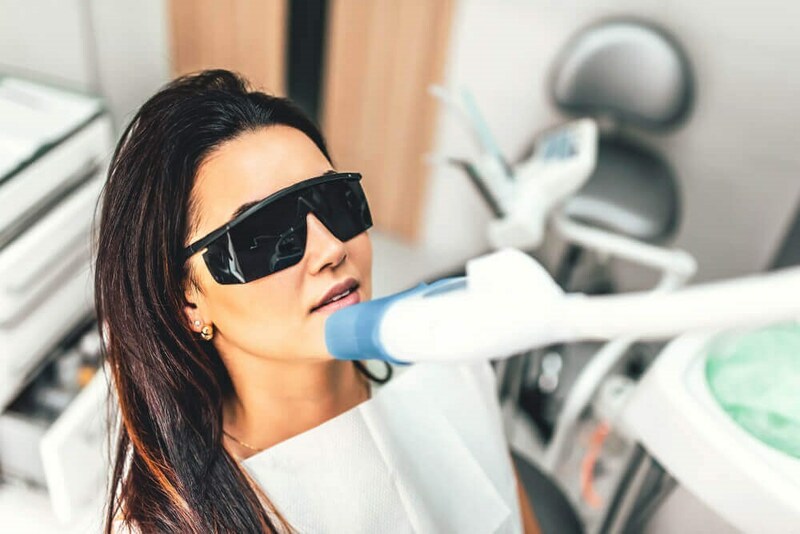 Whenever you've got a lot of teeth whitening options (toothpastes, strips, gels, and much more) you can grab in the store, why would you get laser teeth whitening by your dentist? For starters, laser whitening is more efficient. Over-the-counter whitening treatments have limited effectiveness, which is why it may take a while to get clear results. If you get laser whitening, your smile will be many levels brighter in a single treatment. This is sometimes useful in case you've got a big event (such as a reunion or wedding) and you'd like your teeth to be brighter quickly. Secondly, over-the-counter whitening products are one-size-fits-most, so they don't take into account your particular concerns and goals. You can select an overly harsh product, which might result in dental sensitivity and enamel damage. Your Pearland, TX dentist understands your teeth and also what degree of whitening is best. Your dentist will also ensure your teeth look white and natural rather than abnormal, which occurs when people over-whiten with home products. Laser whitening is your better option when you've got restorations (bridges or crowns). Over-the counter whitening treatments won't affect synthetic surfaces, which means that your results will probably be irregular. Lastly, laser whitening is much better at repairing intrinsic stains in comparison with store-bought whitening products. In case you've got significant staining, laser whitening will be your best choice to restore a dazzling smile. WHAT MAKES MY SMILE DULL? Each single time you drink or eat, extrinsic stains can form on your teeth. Through the years, the stains collect and turn your smile dull and yellowish. A number of the biggest offenders of discoloration are berries, tea, coffee, and cigarettes. While drinks and food, in addition to tartar and plaque buildup can darken the enamel, it is possible to have intrinsic stains discoloring the inside of your enamel. Internal stains are usually caused by certain antibiotics or a injury to the teeth. Aging may induce both extrinsic and intrinsic stains. Intrinsic stains can't be eliminated with store-bought whitening treatments. If you've got internal stains and you would like a whiter smile, then you need to speak with your dentist in Pearland, TX about in-office whitening choices. Following an initial consultation, your dentist can make your personalized whitening treatment program. Your laser therapy will usually be done following your bi-annual cleaning. This will help to eliminate built up tartar and plaque so the laser can evenly brighten your teeth. After your teeth have been cleaned then dried, a barrier will be set on your gums. Afterward, the bleaching gel will be applied to your teeth. After your eyes are shielded, the laser will be directed at your teeth to trigger the bleaching gel. This procedure might be repeated a few more times until your desired results are reached. To complete the process, the barrier will be taken off, then any remaining gel will be removed from your teeth. Following your treatment, it's crucial that you keep your teeth white. At Highland Dental Care and Ortho., we urge our patients to follow a regular home dental health regimen with daily flossing and brushing to address stains. Along with regular brushing, you need to brush, rinse with mouthwash, chew gum, or all of these after you drink or eat something prone to staining. For staining drinks, you should drink through a straw, so the liquid doesn't touch your enamel. If you use any tobacco products, then quitting will stop your teeth from becoming yellow and dull fast. Cleanings from your dentist at least twice a year will allow your dental team to eliminate tartar and plaque buildup, which will dull your teeth, in addition to polishing off stains out of the teeth with professional tools. For those who wish to refresh or enhance their results without a second complete laser treatment, Highland Dental Care and Ortho. creates custom home whitening kits. We can create custom dental trays to give you a more comfortable process compared to over-the-counter kits. Depending on your concerns and aims, your dentist will pick the suitable degree of bleaching gel. Before you go home to use your customized kit, we will go over you specific directions on how frequently to do the treatment and how much time to use it on to get safe, successful outcomes. Highland Dental Care and Ortho. is a modern office with cosmetic treatments and general dental procedures. Our dedicated staff is experienced in performing laser whitening in addition to other innovative procedures. If you think your smile can be helped by laser teeth whitening, then contact our practice in Pearland, TX to schedule your appointment. Our staff will listen to your needs and objectives prior to talking your whitening choices then making your customized treatment program.